Kadis-kot is a board game for two players. Strategema seems like an extreme version of Go. Dabo is a game of chance. None of these games take place on the Holodeck. There are some sports that use holographic elements. Velocity takes place in a very bare Holodeck. But other than that, the Holodeck is mostly used for more informal forms of playful interaction. Environments to hang out in. Alone or with friends. Or opportunities to play stories. Computer, this isn’t what I wanted at all. It’s much too violent. I’m here to relax not to dodge bullets. Umm. More… ambience! Less… substance. 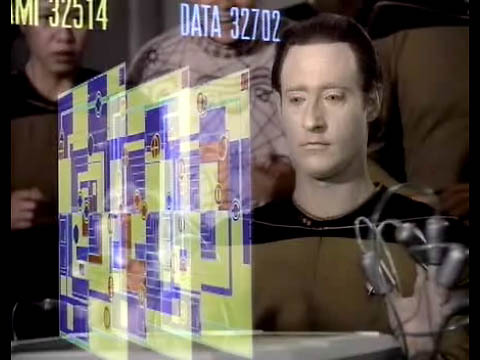 I think the traditional rules of gaming are highly influenced by the way as our input and output tools work, but when (If ever) we reach this state of perfect simulation, people will naturally use them like the people in Star Trek. Man, I don’t want to come across as a total Star Trek nerd but this list is missing a few prime examples. 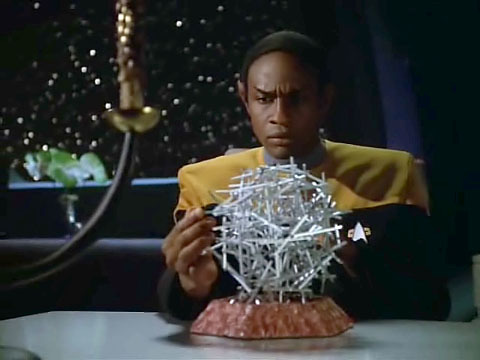 That 3D-ish chess was popular on TNG (along with Poker, but that’s not very interesting). What about that little VR-ish game that had the addictive properties and was used for mind-control that the sneaky Wesley Crush foiled? 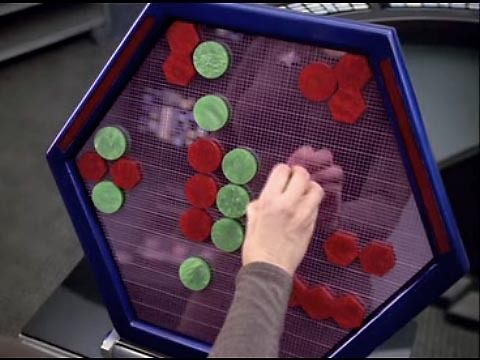 And an early DS9 episode had first contact with a species that used this weird board game / holodeck hybrid. 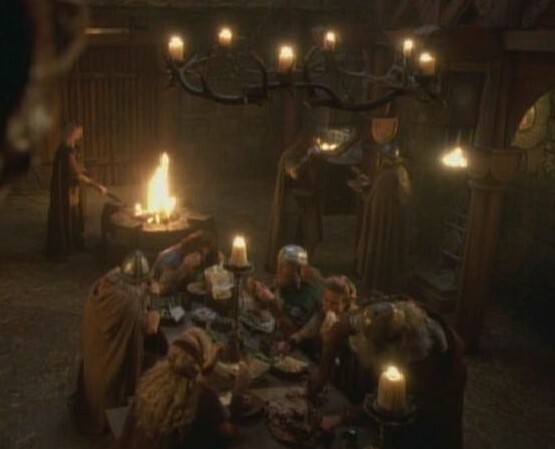 It was essentially live action D&D with puzzles. The whole episode revolved around that game. Now that I think about it, there were a LOT of games in Star Trek. Guess you have to do something to fill your time when there’s no more money and no reason to work. My intention was not to create a complete list of games played on Star Trek. My intention was to point out that the Holodeck, which is a benchmark reference for many game designers, is hardly used for games in the fiction where the concept originated. And that perhaps there is something to learn from that, about the place of games and the role of elaborate simulations. WOW! Michael, I had not figured out you where a trekker! Nice to know, anyway, I’ve enjoyed a lot TNG, not so much the later series. But in my humble opinion, you are slightly wrong, since what you call “spaces to hang out” were more like graphic adventures (like Monkey Island, or Discworld, for instance), cause characters had to solve a particular problem, sometimes involving fight … Captain Proton or the Dixon Hill games always had a mystery or puzzle behind. Foot Note: It would be much secure to have a holodeck than to plug an three-inches pin on the back of your neck like in Matrix. I’ve just came to watch Ghost in the Shell 2 and I do not like that proposal of mechanical humans AT ALL. Hahah. Good point about the mysteries in Captain Proton and Dixon Hill. Though I feel that those mysteries are an essential part of the stories. Much like a mystery novel contains a puzzle aspect. This does not turn the novel into a game. As Star Trek shows, games are abstract systems that don’t require immersive environments. Sports, training and even medical or engineering simulations are indeed an exception. Those are more like “serious games”: they imitate real environments for a specific purpose. But only in so far as those simulations serve that purpose. 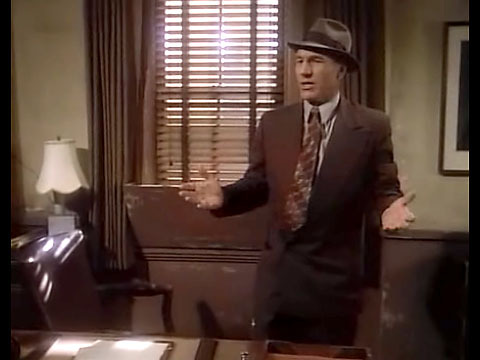 The fictional Holodeck environments tend to be much more elaborate and engaging. I think it’s not correct to say that in Star Trek the Holodeck aren’t used for games, because except for the ones shown in DS9 (the ones operated at Quark’s) the environments are located on military vessels. The DS9 variants definitely have more ‘interesting’ experiences as Doctor Bashir(sp?) used them to play a ‘spy’-adventure (definitely more dodging of bullets in there) and Quark hints at the suites needing repair due to Klingons doing god knows what in there.